These are raw numbers. They are presented by the government itself. 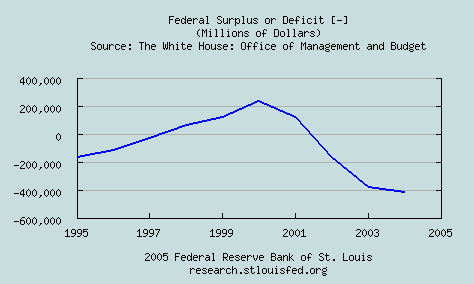 The fact is, G. W. came into office with a record budget surplus, and quickly turned it into a record deficit. He came to office during record low unemployment and turned it into the worst in over a decade, (the 2nd worst having been when his father was in office). And while republican economists will tell you that low unemployment means rampant inflation, you can see that the CPI has grown at a very constant rate at all times. Inflation actually slightly slowed during Clinton's time. In fact, these same trends have been consistent since Nixon in the 1950s. Under every republican president the American budget has done worse, yet they claim to be for smaller government, and being fiscally conservative. all because the government is operating on credit in order to increase spending (80 billion for defense and 200 billion for misc) and cut taxes (-200 billion) at the same time. Debt as percentage of GDP in 2000: 58%. In 2004: 65%. It was higher in 95 (67.2 which is when the real Bush was in office. It was lower in Clintons time, because he actually balanced the budget, and started paying off some of the debt. The two Bush's and Regan had the largest debt to GDP ratio in at least the past 50 years. That’s the same Regan who is championed for his fiscally conservative policies. Note that the deficit is the amount that the debt GROWS every year. There was NO deficit in Clintons time. There was a surplus. Which means, more money was going in than coming out, and we were paying down the debt, and therefore wasting less taxpayer money on interest payments. Bush is operating on credit. It is little different from a household living beyond their means by taking out hundreds of credit cards. The theory is that the investments made on credit will out pace the interest, however, considering the current rate of GDP growth and the historical average interest rate, this is clearly impossible. If we return to the high interest rates of the 80s we could be paying over a trillion (a thousand billion) dollars a year in taxes to interest. That is assuming that the budget becomes balanced as of this year. Since every year the president has lowered taxes and raised spending even more (as has every republican president since the 1950s), this is a conservative estimate. [Note, added 2012: Obviously this is very out of date. Needless to say, the trends continued. As you probably know, in more recent history republicans and conservatives have finally decided it is important to balance the budget instead of assuming the credit account will be good forever. Of course, they decided this while a democrat was in office, and refused to ever acknowledge that is was the people they put in office in the past decades that caused the problem in the first place… but, fine, whatever, better late than never, and the ultimate issue is what is best for our society, not pointing fingers and saying “I told you so”. Unfortunately, despite the historical precedent I pointed out here, this time it was the democrats and progressives who wanted to pretend that running deficits is ok, showing a willingness to sacrifice the not-so-distant future in order to have everything we want right now! Congress and the White House came up with a temporary compromise, but it isn’t over yet – the compromise was to put off the decision for later. What should happen is the default – ALL Bush tax cuts expire, coupled with across the board cuts, including Medicare and the military. There is no remotely good argument not to do this. Everyone has their own special project that they want to be exempt, but the simple bottom line is, either we all make sacrifices, or we start learning to speak Chinese, because the only way we can afford everything is if they buy us. Such an uninformed post. 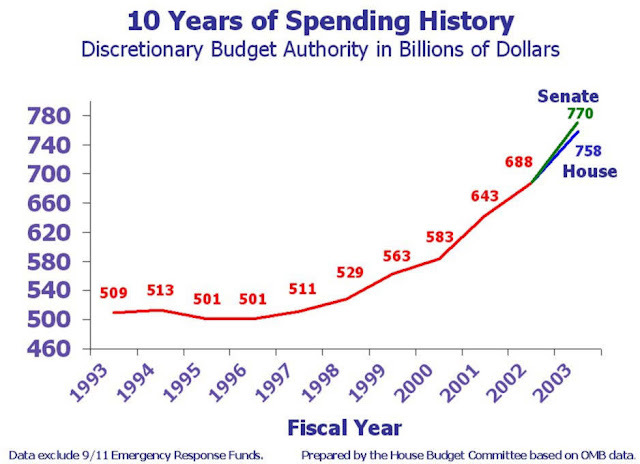 I know people like to blame George Bush but the deficits coincide with the attacks on the US and the war on terrorism. It has nothing to do with being in control or out of control. 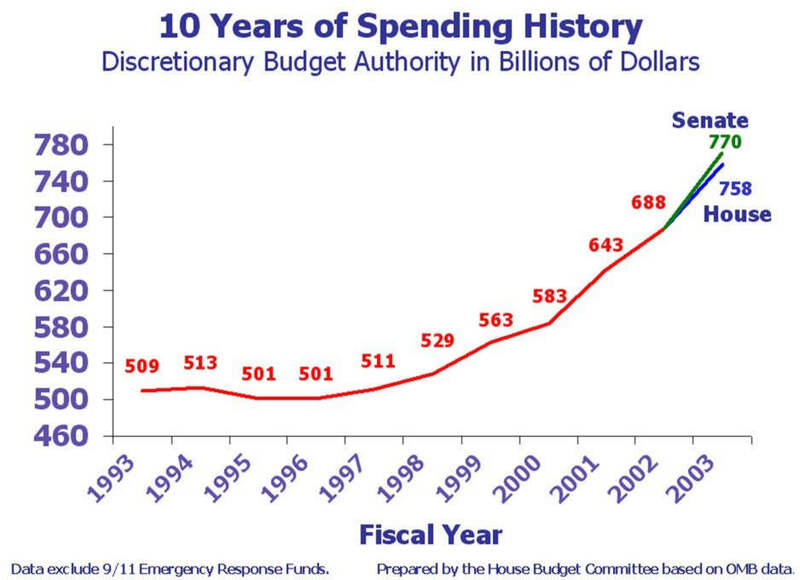 The other thing is that the president is a factor but the real spending is from Congress, and if you look at the same years and which party is in control of congress, you see the out of control spending under the Dems. Did you actually READ the post, or did you just read the headline and skip down to the comments? Massive deficits started under Regan, not the Real George Bush, and certainly not Jr. History does not start over just because you personally become old enough to vote. Even Nixon ran a deficit. There was no "war on terror" in 1969. I also already responded to the issue of congress. Yes, congress writes the budget. And there is one, and only one, individual who can veto it outright. The President. Which means that if congress tries to completely ignore the presidents vision of the budget, they don't get a budget passed. Your argument *might* have some merit if there had ever been a congress with a clear supermajority, including on the committee that actually writes the budget, but so long as it is more or less reasonably divided, no matter which side has a few more seats than the other, the president (and his vice, who is the deciding vote as the head of the senate - and is always the same party as the president) has more influence than any one else.